Despite advances with new generation stents, there remains some atypical coronary anatomy where optimal stenting continues to be a challenge; such as stent sizing in large, ectatic or aneurysmal vessels; tapered vessels; and in vasoconstricted arteries such as in ST-segment elevation myocardial infarction or chronic total occlusions. Balloon-expandable stents are tubular and cannot easily accommodate vessel diameter variations; thrombotic vessels increase the risk of distal embolisation and no-reflow; positive remodelling and vasodilation often result in subsequent malapposition; and patients with bifurcation lesions have a higher risk of adverse events. The STENTYS BMS and DES(P) stents have a self-expanding design, which enables a better anatomical fit to the vessel, even with diameter variations (up to 6.0 millimetres [mm]), and can adapt to changes in vessel size over time. The stents deploy atraumatically from distal to proximal, which could reduce distal embolisation and contain disconnectable bridges, which can be opened up at a side branch. Self-apposing technology could therefore provide a potential solution to current challenges with balloon-expandable stent technology. Robert-Jan van Geuns, Alexander IJsselmuiden and Karel Koch have received consultancy and speaker fees from STENTYS. Katherin Awad is an employee of STENTYS. Significant advances have been made with new generation stents to further improve the results of percutaneous coronary intervention (PCI) and outcomes for patients. Drug-eluting stents introduced in the early 2000s, thinner strut stent platforms, and bioabsorbable polymers and stents are among these developments.1 Despite these advances, there remain some areas where optimal stenting continues to be a challenge, in some cases affecting patient outcome. Stent sizing is often a challenge in large, ectatic or aneurysmal vessels; tapered vessels; and in vasoconstricted arteries such as in ST-segment elevation myocardial infarction (STEMI) or chronic total occlusions (CTOs). The rate of major adverse cardiac events (MACE) and particularly stent thrombosis after primary PCI in patients with STEMI continues to be higher than in PCI for stable patients.2 Restenosis and MACE rates after PCI of saphenous vein grafts (SVGs) or bifurcations are also higher than in simple stenting of a native artery.3,4,5 The incidence of no-reflow and reduced microvascular perfusion in vessels with a large thrombus burden is also greater, one cause of which is distal embolisation.6 Atypical coronary arteries and presentations such as these continue to pose a challenge today in PCI with current balloon-expandable stents. This article examines whether self-expandable stents could address some of these issues and provide an alternative solution in the treatment of atypical coronary anatomy. Vessel lumen sizes are often variable, whereas balloon-expandable stents are tubular by nature. Thus, conventional stents are not able to adapt effectively to atypical coronary anatomy; such as in ectatic or aneurysmal vessels, or in tapered vessels.5,7,8 Currently, the proximal optimisation technique (POT) is used in tapered vessels to try to overcome this restriction. It involves sizing the stent to the distal vessel and then overinflating the proximal segment of the stent with an oversized balloon in a two-step process. This technique is particularly common in the treatment of bifurcation lesions, especially of the left main coronary artery (LMCA).8 The challenge remains when diameter variations are large or varying, due to the subsequent deformation of the stent structure or the inability of the stent to achieve apposition.9Figure 1 shows the result of a balloon-expandable stent deployed in a tapered, aneurysmal tube, after the POT was applied. 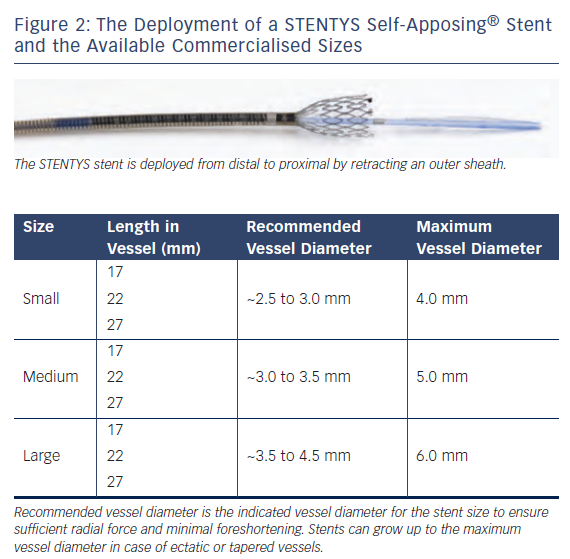 The available sizes for the STENTYS BMS and DES(P) can be seen in Figure 2. Each size is flexible enough to cover a range of indicated vessel diameters, and can even grow beyond this size in case of positive remodelling or extreme tapering. In addition to its self-apposing design, the STENTYS stent contains small, disconnectable bridges all along the stent, which can be disconnected to provide an opening to the side branch. A percutaneous transluminal coronary angioplasty (PTCA) balloon is inflated at low pressures within the distal cell to disconnect several bridges around the side branch to create access. The stent then self-expands into the side branch, thus providing a flap to cover ostial side branch disease. The instructions for use (IFU) for the STENTYS BMS and DES(P) lists the stent indications as: improving coronary luminal diameter in native coronary arteries and coronary bypass grafts in the treatment of acute coronary syndrome (ACS); de novo lesions in vessels involving a side branch (bifurcation); and de novo lesions in vessels with diameter variations (e.g. tapered, ectatic). 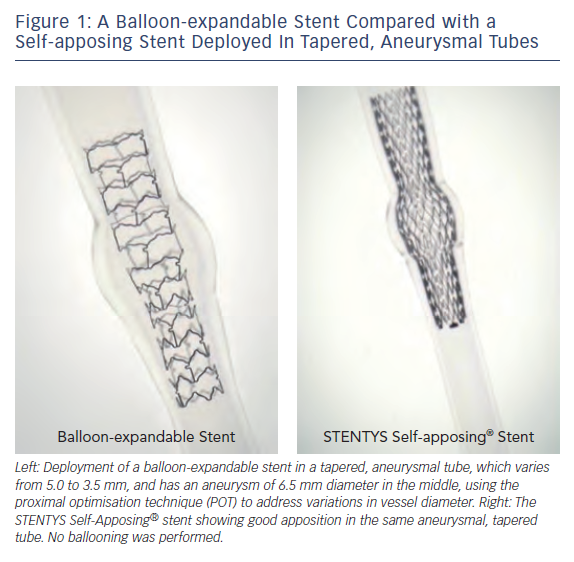 In ectatic, tapered or aneurysmal vessels, the STENTYS stent, due to its self-apposing design, is able to appose itself all along the vessel even in cases of large diameter variations, thus avoiding malapposition. As a result, POT and complex ballooning such as the use of kissing balloons are not required (see Figure 1). The STENTYS stent can expand beyond the range indicated in case of tapered or ectatic vessels (see Figure 2). In particular, the large STENTYS stent is indicated for vessels from 3.5 to 4.5 millimetres (mm), but can be used in vessels up to 6.0 mm without additional treatment, if necessary. Gentle deployment of the STENTYS stent from distal to proximal (see Figure 2) may capture loose thrombus and reduce the likelihood of thrombus dislodging and travelling distally during stent deployment. In addition, high pressure ballooning is not required during stent deployment,10 although low pressure post-dilation is advised to ensure sufficient stent expansion. Small cells (see Figure 3) also provide a cover for thrombus to reduce the degree of thrombus prolapse. The STENTYS stent could thus be a good solution in vessels with a large thrombus burden such as SVGs or in a STEMI patient, where distal embolisation and no-reflow occur more frequently than in stable cases. The disconnection feature of the STENTYS stent, which unlocks bridges at a side branch, can be used in the treatment of bifurcation lesions to create a wide enough opening to facilitate the deployment of additional stents or the use of devices, if deemed necessary by the operator. Due to the self-expanding nature of the STENTYS stent, malapposition in the main branch is not an issue, even when side branch access is granted.14 In addition, the stent apposes well to tapered main branch vessels, which are commonly found in the bifurcation anatomy. Drug delivery is maintained over the length of the stent, even at the side branch, as no strut deformation takes place. A male patient of 73 years with three hours of chest pain presented at the catheterisation laboratory with STEMI. Diagnostic angiography showed Thrombolysis In Myocardial Infarction (TIMI) I flow in the anterolateral (AL) region with a suspected ostial lesion in the left anterior descending (LAD) artery. Upon examination with intravascular ultrasound (IVUS), it was found that the left main (LM) measured 6.8 mm and the proximal LAD measured 5.6 mm. At the level of the stenosis, there was a mean lumen area (MLA) of 3.2 square millimetres (mm2) (see Figure 4a). The AL branch was treated with two XIENCE PRIME stents (Abbott Vascular, Santa Clara, CA, US) of sizes 2.25 x 18.00 mm and 2.25 x 12.00 mm in an overlapping manner. The LM/LAD arteries were pre-dilated with a TREK 3.0/12.0 mm semi-compliant balloon (Abbott Vascular). Due to the varying vessel diameters along the lesion, the very large diameters of the LM and LAD, and to prevent undersizing and malapposition especially in the LM, a self-apposing STENTYS stent (STENTYS SA, Paris, France) was selected to stent the lesion. A STENTYS DES(P) 3.5-4.5/27.0 mm can grow to over 6.0 mm in tapered vessels, and can also be disconnected at a side branch in bifurcation cases thus avoiding strut deformation. The stent was positioned (see Figure 4b) and deployed, and subsequent post-dilation was performed with a 5.0 mm balloon within the stent. A balloon was tracked through the most distal cell into the left circumflex (Cx) artery where it was inflated between the struts, resulting in a disconnection of the stent bridges and an opening of the stent towards the circumflex. The final result was astonishing (see Figure 4c) and the post-procedure result was maintained out to three months. A 76-year-old male with a history of PCI of the LAD in 1990 (anteroseptal infarction), and a 2012 echocardiogram showing akinesia of the apex, and anterior and lateral walls, presented with a non-STEMI (NSTEMI). He was known to have had transient ischaemic attacks (TIAs) and hypertension. The baseline angiogram showed a large aneurysmal right coronary artery (RCA) with long, significant stenoses (see Figure 4d). It is technically challenging to appose balloon-expandable stents to ectatic, aneurysmal, large vessels such as this one, and thus treatment with a STENTYS stent was chosen. Pre-dilation was performed using a TREK balloon (Abbott Vascular) of size 3.0/10.0 mm at 10 atmospheres (atm). A STENTYS 3.5-4.5/27.0 mm was subsequently positioned (see Figure 4e) and deployed over the lesion, followed by post-dilation with a 4.5/20.0 mm balloon at 10 atm. The final angiogram showed an optimal result (see Figure 4f). At six months, the patient had no events and was angina-free. A 53-year-old male patient had a history of an inferior-posterior infarct in 1993 and coronary artery bypass grafting (CABG) in 1994. In 2010, his left internal mammary artery (LIMA) to the LAD was found to be patent, but a SVG was occluded at the distal anastomosis. In 2011, he was a participant in stem cell therapy. The patient presented with severe anginal complaints with Canadian Cardiovascular Society (CCS) grade 3/4, despite extensive anti-anginal medication. 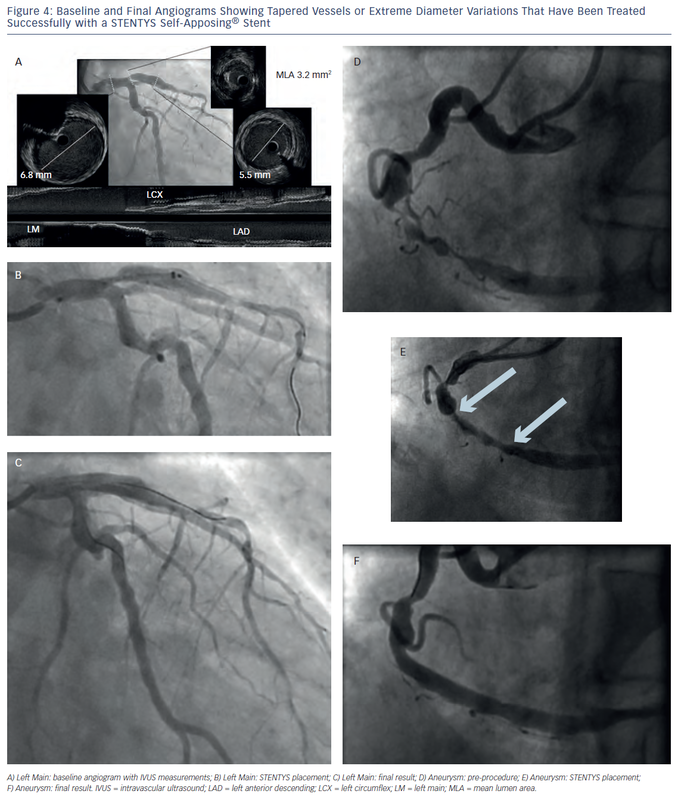 A coronary angiogram revealed a 100 % occluded RCA and left coronary artery (LCA), a patent LIMA to the LAD with collaterals to the RCA, and a significant ostial lesion in the distally occluded SVG (see Figure 5a). The challenge of this case was the ostial location of the lesion and the risk of distal embolisation. The lumen diameter was quite large, increasing the risk of possible undersizing. A self-apposing stent was considered due to its deployment from distal to proximal, which could limit the risk of distal embolisation, and its ability to provide better apposition of this large, irregular venous contour, even after resolution of thrombus/ debris following PCI. A 6-French guiding catheter with good support was selected (Multipurpose (MP) 2.0). After pre-dilation, a STENTYS DES(P) 3.5-4.5/22.0 mm was positioned at the ostium of the SVG (see Figure 5b) and deployed. Post-dilation of the ostium was performed with a 3.0/12.0 mm Maverick balloon (Boston Scientific, Natick, MA, US) at 16 atm. The entire stent was then post-dilated with a 4.5/8.0 mm Quantum Apex non-compliant balloon (Boston Scientific) at 12-16 atm. The final angiogram showed a good result (see Figure 5c). A male patient of 74 years had a history of PCI of a diagonal in 2002, a coronary angiogram revealing a CTO of the RCA and a 90 % stenosis of the Cx in 2011, and PCI of the Cx in 2012. He presented with severe anginal complaints, with CCS grade 3/4 despite extensive anti-anginal medication. Angiography was performed via the radial artery and a CTO of the mid-RCA was confirmed (see Figure 6a). No significant stenoses were found in the LCA, and there were small collaterals to the posterior descending artery (PDA). An Amplatz Left 2.0 (AL2) guiding catheter (Cordis Corporation, a Johnson & Johnson company, Miami Lakes, FL, US) was chosen for good backup with a Pilot 50/150 wire (Abbott Vascular), and the occlusion was crossed (see Figure 6b). Pre-dilation was performed with incremental balloon diameters starting at 1.25 mm, then 2.00 mm and then 2.50 mm to restore flow. Due to concern about the actual vessel size post-recanalisation and the risk of long-term malapposition, stent thrombosis and repeat PCI or restenosis, the STENTYS technology was selected. STENTYS DES(P) stents of sizes 3.0-3.5/27.0 mm and 3.0-3.5/22.0 mm were placed proximally and distally, respectively, in an overlapping manner. Both stents were post-dilated with a Quantum Apex (Boston Scientific) non-compliant balloon of size 3.5/15.0 mm at 14 atm. 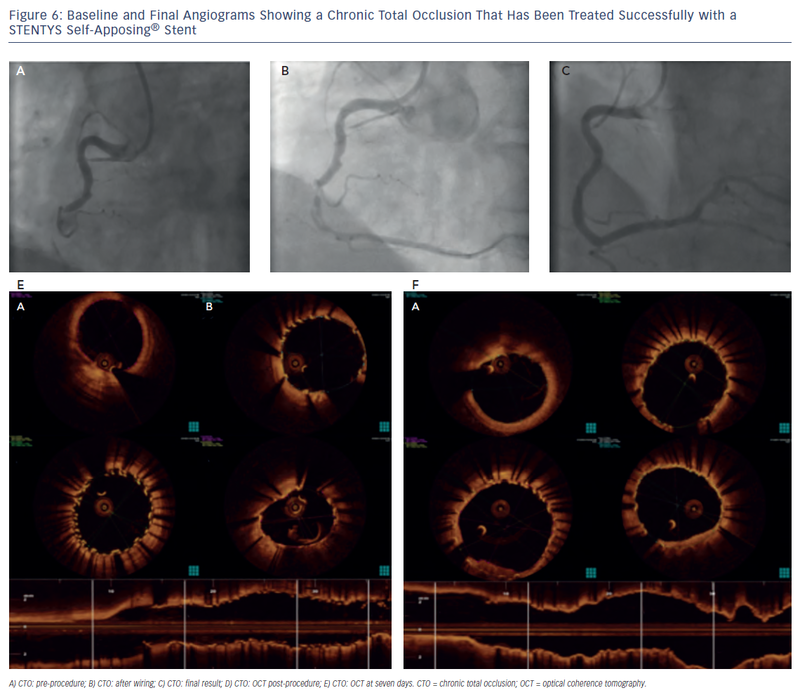 Optical coherence tomography (OCT) confirmed good stent apposition to the vessel wall (see Figure 6d), and the final angiogram showed an optimal result (see Figure 6c). At seven days post-procedure, the patient underwent another coronary angiogram, which showed a sustained optimal result. OCT at seven days (see Figure 6e) revealed an increase in minimum lumen area of 11 % since post-procedure. One year later, the patient was performing heavy physical exercise on his horse farm without anginal complaints. Self-expanding stents have been used in non-coronary interventions for many years due to their unique characteristics allowing them to adapt to varying anatomy. Previous versions using mesh designs have been limited due to uncontrolled expansion and the absence of local drug delivery, which is essential in smaller vessels. With the introduction of this easy-to-deliver, well-controlled, self-expanding stent, the interventional cardiologist has a new and unique tool in their toolbox. The above-described clinical examples are clear demonstrations of the potential of this technology. Currently, the device has indications in selected cases with extreme calibre difference along the segment to be treated, or an expected significant change in diameter in the future. Implantation success in experienced hands is quite high; however, due to its large profile, very complex calcified lesions may not always be successfully crossed whereas the latest generation of flexible, thin-strut, balloon-expandable stents could be successful in these lesions. Some smaller clinical studies and registries have been completed as a starting point for the collection of the evidence necessary for full acceptance of this technology. The STENTYS clinical programme consists of the APPOSITION series of trials in STEMI patients, the OPEN trials for bifurcation lesions, an ADEPT trial for SVGs, and a new all-comer Sizing registry of 3,000 patients looking at cases where a STENTYS stent has been implanted where sizing has been a concern (e.g. aneurysm ectatic vessel, bifurcation/left main, CTO, SVG, tapered vessel, thrombus-containing lesion, NSTEMI, STEMI, unstable angina). The SIZING registry was initiated in June 2012 and enrolment is still ongoing; no results have yet been publicly presented or published. The randomized Comparison Between the STENTYS Self-Apposing Bare Metal and Paclitaxel-Eluting Coronary Stents for the Treatment of Saphenous Vein Grafts (ADEPT) trial in 57 patients completed enrolment in early 2014. Results on the primary endpoint of in-stent late lumen loss at six months are expected late 2014. In terms of results, the STENTYS stent showed in the Assessment of the Safety and Performance of the STENTYS Self-expanding Coronary Stent System in Acute Myocardial Infarction (APPOSITION I) study that the culprit vessel increases by 19 % three days after a STEMI procedure, and the stent follows this increase (18 % increase).13 Patients with a STENTYS stent implanted had 0 % stent malapposition after three days, compared with 28 % malapposition for the balloon-expandable control stent in the Randomized Comparison Between the STENTYS Self-Expanding Coronary Stent and a Balloon-expandable Stent in Acute Myocardial Infarction (APPOSITION II) randomised, controlled trial.10 At one-year after STEMI in the large, 1,000-patient, Post-market Registry to Assess the Stentys Self-expanding Coronary Stent in Acute Myocardial Infarction in Real Life registry (APPOSITION III), STENTYS patients had a cardiac death rate of only 2 %. This study also demonstrated the need for low-pressure post-dilation for additional plaque modification to ensure sufficient stent expansion. The Randomized Comparison Between the STENTYS Self-apposing Sirolimus-eluting Coronary Stent and a Balloon-expandable Stent in Acute MyocardIal Infarction (APPOSITION IV) trial randomising the pre-market STENTYS Sirolimus-eluting stent to the Medtronic Resolute in STEMI patients showed a significantly greater number of fully covered stents at four months in the STENTYS arm. The feasibility of disconnecting a STENTYS stent at a bifurcation has been demonstrated in the STENTYS Coronary Bifurcation Stent System for the Percutaneous Treatment of de novo Lesions in Native Bifurcated Coronary Arteries (OPEN I) trial with a subsequent six-month MACE rate for the STENTYS DES(P) of 3.7 %.14 The Assessment of the Long-term Safety and Efficacy of the STENTYS Paclitaxel-eluting Self-expanding Stent in Coronary Bifurcation Lesions (OPEN II) bifurcation registry of 217 patients treated with the STENTYS DES(P) showed a six-month MACE of 10.1 %, and no difference in survival between patients receiving kissing balloon inflations or not at the end of the procedure. 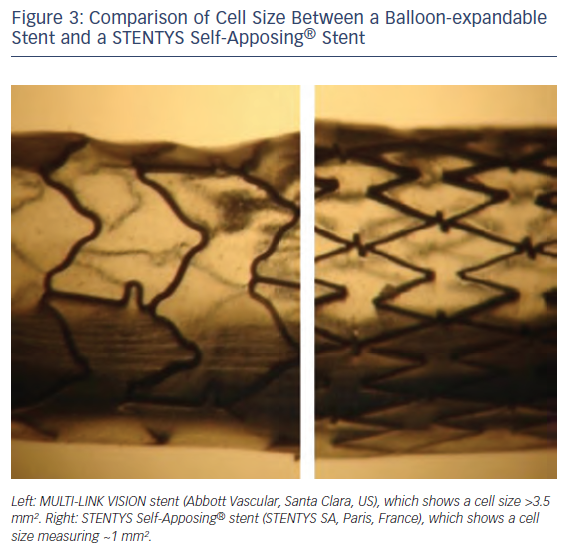 In challenging anatomy such as tapered vessels, bifurcations, left main, SVGs, CTOs, and aneurysmal or ectatic vessels, the STENTYS Self-Apposing stent could provide an alternative solution over balloon-expandable stents to achieving simplified stent sizing with improved apposition, both during the procedure and in the days following in case of positive remodelling.